The DGA Mach V No Frills disc golf basket is permanent and not removable. Since it concretes straight away into the ground, it cannot be easily removed. It concretes straight away into the gound. It is not easily removable. 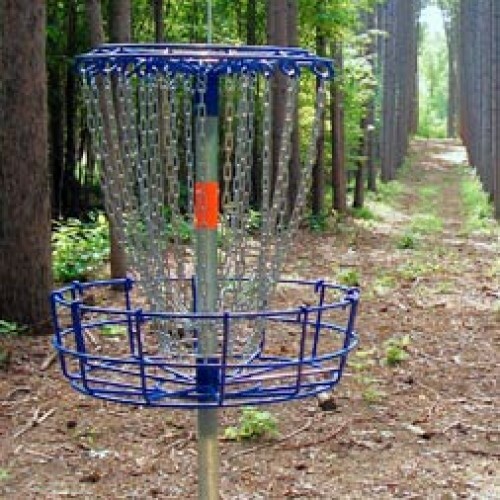 Perfect choice for city and state parks, high use disc golf courses and for championship tournament play. Renowned for being the most advanced and innovative Disc Pole Hole available. 3 rows of chains that decelerate a disc as it hits each successive row. Inner row of chains - Patented - 6 chains on the innermost row protect the pole and prevent high velocity discs form bouncing off the central pole. Guaranteed for 20 years against failure due to rust and corrosion.